A train passes through a newly installed iron support with hanging concrete balls in Indonesia last week. Is the threat of getting their heads smashed by a concrete ball enough to prevent people from riding the roofs of Indonesian trains? "From our monitoring so far, the roofs of the trains have been clean (from riders) after the concrete balls were put in place,” a spokesman for state railway company Kereta Api Indonesia, Mateta Rizalulhaq, told the Jakarta Globe on Monday. The devices erected over some train tracks are called Goal Bola-bola, or goal balls, as they resemble soccer goals with the grapefruit-sized concrete balls strung from chains. The balls are about 10 centimeters, or 4 inches, in diameter and are painted silver. They a strung in groups of a dozen each over each track. The first ones were deployed Tuesday. But in a Globe report on Saturday, Eman Sulaiman, chief of the Bekasi city station, near which the first set of concrete balls were strung last week, said some people are still trying to ride, donning motorcycle helmets for protection. Passengers are climbing onto roofs after trains pass the obstacles, according to a report Friday in the Jakarta Post. Eman said more obstacles will be erected, with larger balls, the Globe reported. 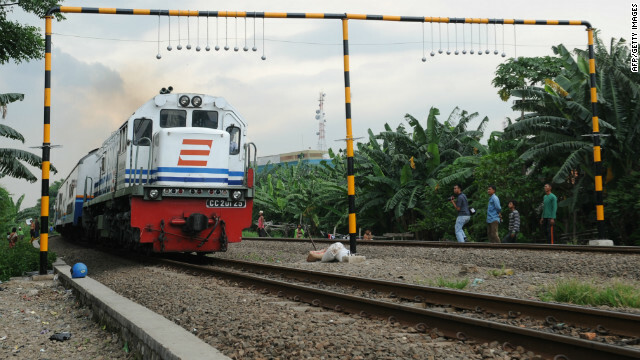 Yosep Adi Prasetyo, a spokesman for the National Commission on Human Rights, criticized the railway last week for deploying the balls, saying they could exact a harsh punishment for a minor infraction. But railway spokesman Mateta said the balls are actually protecting riders, the Globe reported. “Roofs of trains are from the onset not designed to support people, and there have been many victims already,” he is quoted as saying. The Jakarta Post reported late Monday that a man fell off the roof of a train and was hit by a train traveling in the opposite direction, killing him instantly. The balls will be used only on lines that run locomotives, according to a Globe report last week. Lines with electric trains will use swinging doors that will allow the electrical connectors through, but not roof riders. A lot cheaper than lethal injection and more fun too! A cold beer says they will end up on eBay. This will be interesting to see what the USA will come up with since more and more people are traveling by rail illegally now.